Heavy sigh. I need to get a new kitchen timer. I have one on the stove that doesn't always buzz. When it does, you can hear it on the deck, with the back door closed, it's that loud. I also have one you turn. It's clicking sound used to get louder when there were 5 minutes left and then there was a sharp "ding" as the timer went off. Neither one of these is working properly. 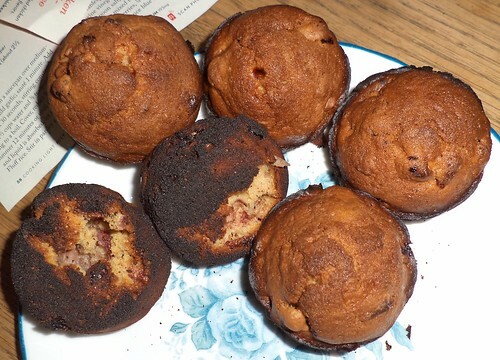 They won't consistently go off when time is up which leads to the above burnt muffins. The insides are still okay, but, unless you like the taste of charcoal, the outsides aren't real good. When I replace these, I need two of them. Many times, I have something cooking on the stove while something is baking in the oven. Plus, I have to look at the design. Do I want cheap and functional, retro, digital or whimsical? I'll tell you what I don't want, a timer that costs nearly $80. Seriously. When I added it to my cart and they calculated shipping and handling, it was $89.98. Who spends that kind of money on a kitchen timer when a $5 penguin will do the same thing? That timer better come with a life-time replacement warranty and be tough enough to survive a nuclear blast. I prefer whimsy so I'm on the lookout for cute, funny, silly but functional kitchen timers. You can leave me a suggestion in the comments. I'm not going to spend over $10 for this. The wind up one I'm replacing I got at Target 25 years ago for $10. I'd say I got my money's worth.